Although I think it’s important for larger clinical trials to be undertaken looking at hard clinic endpoints of CV outcomes, end-organ damage, and QALY, however the results of both these trials are very much intriguing, and I don’t believe that the primary outcome of “diabetes remission,” is that hollow. Although it is true that A1C is not a robust surrogate marker, but drop in A1C with virtual elimination of pharmacotherapy is rather impressive finding. 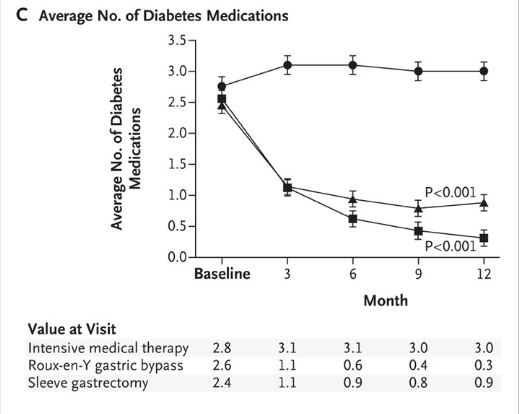 Moreover the finding that diabetes remission occurred independently and in some patient prior to onset of any weightloss is even more intriguing and confirmatory of prior studies. I agree that this these two studies would not change my clinical practice at this time, however I can forsee future larger clinical trials looking at inclusion of diabetic patients with less severe of a disease process and lower BMIs. Thanks for your comments, I agree with them all. 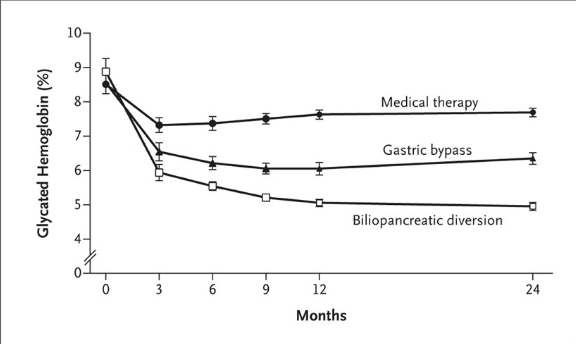 We will definitely be seeing trials upcoming with bariatric surgery for diabetic patients with lower BMIs than the ones in these trials (avg BMI 35 and 45). I also agree 100% that the drop in A1c without need for medications is a very real and meaningful outcome.